Kidbuddie is one of South Africa’s leading adventure playground and jungle gym manufacturers. The thing about Kidbuddie is that we provide safe outdoor play areas for children. Our extensive range of child-friendly products are designed to develop essential motor skills, co-ordination and confidence. We deliver to all the main centres countrywide and have experienced installation teams in Cape Town, Johannesburg, Durban, East London, Bloemfontein and the Garden Route. We have also exported to Lesotho, Namibia, Botswana as well as Angola and Mauritius. All designs are available in Kit form with detailed installation instructions, for clients who wish to install themselves. 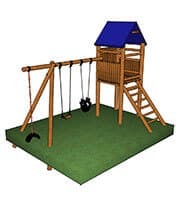 We have been designing, testing and manufacturing Playground Equipment since 1993, supplying a wide range of products to private homes, schools, housing developments, hotels, shopping centres and public parks all over the country as far afield as Mauritius. Our equipment is made from the best quality timber in the country – Cape Pine, treated to stringent SABS specifications. Our equipment is made from the best quality timber in the country – Cape Pine, treated to stringent SABS specifications. Accredited installation teams are available in the main city centres including Cape Town, Durban, Bloemfontein, East London, Johannesburg and the Garden Route.